Yes, I'm here. And I'm organized. And Spence is lucky to have me. I think he's beginning to realize that. Well, he always knew it when it came to WORK -- but he didn't seem to think that there was such as thing as "real life." Now he knows better. He's off in Timbuktu or someplace right now, and I've been working with Anne to try to put together a contest. He rings me every once in a while with an idea. But Spence is all about the big picture, not the details. He'd forget to end it. So Anne has called Theo and he's going to drop by and we're going to talk about it next week. He has a lot of ideas, too. He still thinks he's Mr Contest after he put together the "Here Come the Grooms" contest. (He doesn't seem to realize that Martha and the other gals put together the "Here Come the Brides" contest first). Ah, men. Anyway, I just wanted to say hi and I hope you'll enjoy our book, The Boss's Wife For A Week, when it finally hits the shelves. Kate H and Abby G seem to have got their copies through the mail and liked it -- so that makes me happy. Just being back to visit with you all makes me happy. And I did NOT alphabetize my stuffed animals. Sheesh! I tried to leave a message for Spence to say how much I loved your book, but Blogger was having none of it. Fingers crossed this works today. Great to have you back posting, and I am so glad that the silly man came to his senses eventually and realised how much he loves you and how important you are to him in every way and not just work. A good idea for you to take over the organising of the contest - not Spence's strong suit, getting to the detail of things. Just as well given your story as it all worked out in the end that he made a mess of the paper work! I hope you have a long and happy life together and despite his protestations to the contrary, I know he'll make a great father. Have fun, live well - and I am still so envious of that waterfall shower! I'm so glad you liked our book! Spence is, too. And I'm glad you agree that he's not really a "contest planner" sort of guy. It was lovely of you to stop by and say you enjoyed it. Thanks so much! I'm soooo thrilled to have a cat named after me. I'm sure she's a great cat, and I'm looking forward to seeing pictures of her. Anne has promised to show me some you sent. Spence says he doesn't think I'm very catty. I'm glad he said that. But I'm also glad to have a little furry namesake! Thanks! Hope, now that you've named Sadie, you like the book! That's quite a collection of stuffed animals, lol! Thanks! Glad to be back. This waiting in the wings gets tiresome. But at least I got a lot of filing done -- and a lot of stuff sorted. 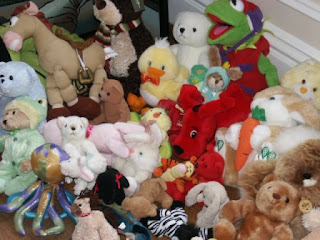 And yes, there were a lot of stuffed animals, which is why I never ever considered alphabetizing them! Sadie (and Spence) I am so very pleased that you are both back. The postman brought your book today. And it is sitting on mydesk -- whispering read me. But it is my carrot for finishing my word count. Hurry up and finish your word count! Glad you got the book. Hope you enjoy it.